• No show: Can’t be seen when wearing a pair of sneakers. • Ankle high: Only comes up to the ankles, barley visible with a pair of sneakers. • Calf high: Comes up to the bottom of the calf. Some like to pull them all the way up while others prefer to push them down. • Knee high: Generally reserved for outdoor activities in the winter time when it is cold. The length is generally a personal preference but what should be considered before you buy socks is what do you need the socks for? • Athletic socks: If you are into sports and are buying socks for your sporting event, be sure to get socks that have plenty of padding on the underside. This will help absorb all the shock from the added activity of the sport. • Work socks: If you need to buy work socks it is because you have a job where you stand on your feet part or all of the day. These socks should be thicker to offer you the most cushions possible so they can act like a shock absorber to your entire foot. If you wear work boots at your job, be sure that you get a sock that is high enough to cover the entire area and then some that the boot covers. You don’t want to get ankle high socks for work boots that are high topped. • Business socks: These stocks are generally lighter in material and are always colored. If your feet tend to sweat a lot you can buy business socks known as liner socks. These types of socks will help you to wick away sweat and avoid a wet and smelly foot. Aside of business socks which come in a million different colors and patterns, most socks now come in white, black, blue, and even some other colors. There is really no advantage to one color over another, except that a darker color will of course hide stains better, so the choice of color is really up to you. Usually people choose sock color by what else is being worn. 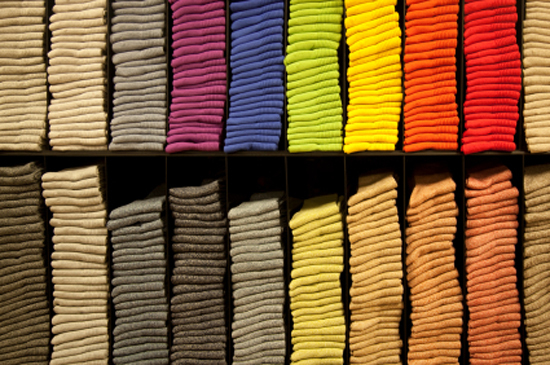 The majority of socks are made of cotton because this allows for the foot to breath. However, if you are doing outdoor activities in the snow for example, a nice heavy duty wool pair of socks will keep your feet warmer and dryer than regular cotton. Socks come in all shapes, sizes, and colors now. Having the proper pair of socks for what you are doing will help keep your feet feeling good all day long.